Natalie Legrand is a Senior Program Manager at PYXERA Global where she manages Global Pro Bono projects. 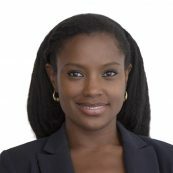 She is a multilingual professional with over 10 years of public and private sector experience in a variety of positions. After graduating from UNC-Charlotte with a BS in Accounting in 2005, Natalie spent several years in corporate America as a finance, and change management professional, specifically in manufacturing and software industries. Natalie is fluent in Spanish, and Russian, and has a passion for health, fitness, and helping people realize their potential.